Amish quilts: The quilts which are made by or in the style of the Amish quilters in Pennyslvania, or Ohio and Indiana. Geometric patterns and central medallion square-in-a-square with wide borders is a popular design in the Amish community. Appliqué: A technique where fabric shapes are cut and sewn on to a background fabric or quilt top. Appliqué can be pieced together by hand, machine, or with fusible web. Appliqué is used to prettify or create interest to a block or quilt. Attic window quilt pattern: A visual illusion quilt pattern which makes it seem as if you are looking at the quilt block through a window. Backing: A quilt consists of three layers: quilt top, batting and backing. The bottom layer of a quilt, backing, is a piece of fabric which is usually a single piece. Bargello: A type of quilt which creates movement by the way of strips of fabric squares are sewn together. Quilters usually use the same colour going from dark to light. Basting: Long, temporary stitches are used to hold fabric layers together öbefore the final stitching is done. The aim is to hold three layers in place during the quilting process. A quilt is usually basted in sandwich stage before final quilting. The stitches are removed when quilting is completed. Batik fabrics: A method of dying fabric where some areas are covered with wax or other substance to make designs by keeping dyes penetrating in pattern areas. Hot water is used to remove the wax. Batting: The middle layer of the quilt between the quilt top and the backing. It provides warmth to the quilt. It is usually made up of cotton, polyester and wool. Binding: The final stage to finish the quilt. Long, thin fabric strips which is often folded double are sewn over the raw edges after the quilting of the quilt is completed. Big stitch: A type of quilting where big stitches with colourful threads are used to create a decorative effect. Block: The basic quilt design unit. 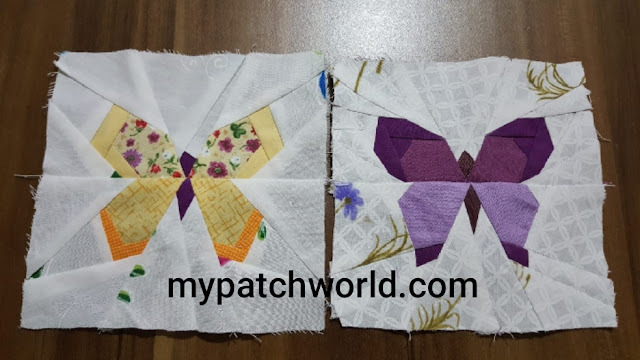 A quilt block can either be a single piece of fabric cut into squares or other geometrial shapes or a block which has been pieced using many pieces of fabric sewn together. Border: A pieced of fabric or a strip of fabric added to the edges of the quilt, used as a frame. It is sewn outside of the quilt. Borders can be wide or narrow. Charm quilts: It is a kind of scrappy quilt made with many many scraps where each piece is a different fabric.The pattern is usually a one patch design. Many quilters trade or swap fabrics with friends in order to collect a variety of fabric for their charm quilt. Clamshell: A filming quilting patterns with symmetry and overlapping circular shakespeare, remind you of fish scales. You can create the clamshell design by using a glass or cup to trace. Crazy quilts: A quilt made randomly from the blocks of odd shapes of scraps sewn together. There is no pre-determined pattern or design. When crazy quilt blocks assembled together, they make a crazy quilt. Disappearing nine patch: A kind of beginners' quilt, which is made by cutting up a nine patch into four quarters, putting them into different positions and piecing the blocks again. Many layout options are available for this pattern. Dresden plate: One of the most popular quilts during the 1920s-30s, also known as sunflower, dresden plate is an appliqué quilt with petal shapes that radiate from a center circle. Electric quilt (EQ7): A computer programme used for designing quilts. English paper piecing: A method of hand piecing where paper templates are used. Fabric is stabilized over the paper template. 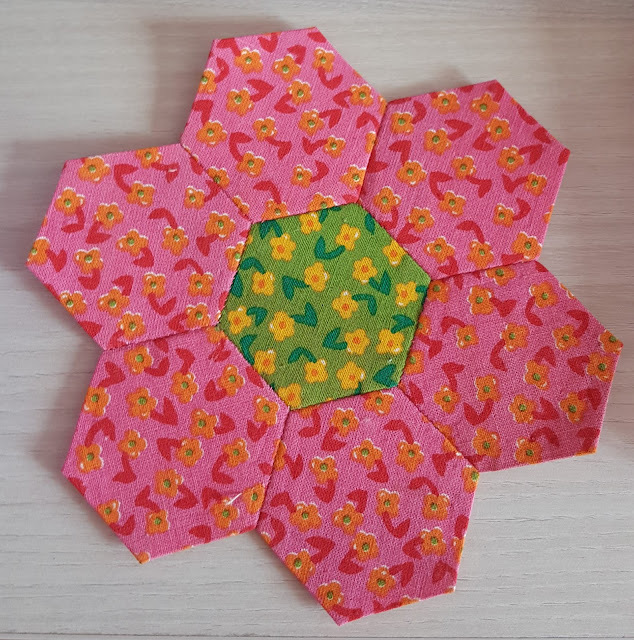 One of the most popular english paper piecing pattern is Grandmother's Flower Garden which is made by using hexagons. Fat quarter(FQ): A half yard of fabric which iş cut in half again vertically and is now 1/4" yard, measuring 18"×22" and suitable for cutting larger block sizes. Finger pressing: The technique of pressing with tip of your finger or fingernail along seams to make it lie flat. Flying geese: A common patchwork pattern where two triangles are pieced onto the sides of a larger triangle so that you create a rectangular piece of patchwork. Foundation paper piecing: A technique used for joining small pieces of fabric to make a more complicated pattern and design by using numbered paper as a foundation. It assures accurate and stable blocks. Fussy cut: In order to use the image or motif on the fabric, a specific area of the printed fabric is cut. In this was you get the specific image you want to use. Half square triangles (HSTs): A triangle is created when a square is cut diagonally. Two half square triangles are obtained from a square. Irish chain: It is a classical quilt pattern which has several variations. Diagonal squares that only match up at the corner points are the most common. It is great for beginners. Jelly roll: They have become popular among quilters. Jelly rolls which contain a bundle of pre-cut strips measuring 2.5"x 44" can be got from many different fabric companies or shops. Layout: The process of arranging and rearranging the blocks and the pieced units to form different looks and decide the final form of the quilt. Log cabin: A quilt pattern in which strips of fabrics are sewn together in a numerical sequence around a center square to form a block. Log cabin is a traditional but popular design which has many variations. Long arm quilting: A kind of sewing machine with a long arm which is used for quilting. A quilter may use her free motion skills with this machine. Machine appliqué: The process of sewing fabric motifs on the fabric using a sewing machine. Memory quilts: The quilts which are made to remember people or events that are significant in their lives. These quilts usually include clothes, such as T-shirts, baby clothes, from the ones that the memory quilt is attributed to. Mug rug: A mini quilt similar to a coaster. Mystery quilt: A kind of quilt pattern written in seperate sections and disclosed one section at a time in order to hide the completed quilt. It is usually preferred for group projects. Nine-patch: A quilt block that includes nine squares of patches arranged in three rows horizontally. It is perfect for beginners, easy to make. Needle-turn appliqué: It is a traditional hand appliqué technique in which seam allowances are turned under while sewing the motif to the background, as a result you have invisible stitches. Outline stitch: A decorative stitch used in embroidery which forms a narrow line. Panel quilt: A pre-printed fabric panel, a large piece of fabric printed with some kind of picture or scene, is used to make a quilt. These fabric panels are ready to use as quilt tops, so there is no need to cut them up for patchwork. Patchwork: The process of sewing many small pieces of fabric together to make a larger fabric or design for a quilt top. Pinwheel: A quilt pattern block which includes four triangles that are arranged in a pinwheel pattern. Pre-cut fabric: Type of fabric bundles which are pre-cut by the manufacturers. Jelly rolls, fat quarters are some examples of pre-cut fabrics. Pressing: An iron is used to press seams and blocks. You do not move iron forth and back or use steam, which would cause stretching or distortion of seam. Pressing is necessary for obtaining precision in quilting. Quilting: The process of sewing the three layers of quilt together. Quilt sandwich: The layering of the quilt top, batting and backing together. This is the last step of quilting. Rag quilt: A kind of piecework where seams are exposed on the front and finished seams on the back to have a ragged look. Raw edge: The unsewn edge of the fabric which is sometimes used decoratively. Rotary cutter: A tool with a sharp circular blade with a handle used to cut fabric on a cutting mat, preferably by using a ruler. Sashing: Strips of fabric sewn around or between the patterns or blocks, framing them and making the quilt larger. Scrap quilt: Quilts that are made from leftover fabrics from other quilt projects. There are some patterns for this style of quilt or you just sew scraps together randomly and then cut them in to blocks. Seam allowance: The width of fabric on the right of the sewing line.This is usually 1/4" in quilting. 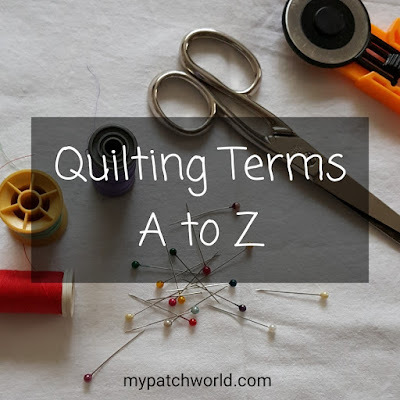 Stash: The term refers to the quilter's collection of fabric, which is usually a big amount. Stitch in the ditch: It is a method of stitching that is used next to the seams in a quilt in order to define blocks or shapes. Sunbonnet Sue: An appliqué design of a girl hiding her face behind her sunbonnet. The design has been around since 1920s and still popular among quilters. Template: A shape or design cut from a cardboard and placed on fabric and used as a pattern to trace piecing or appliqué pieces. Unfinished objects (UFOs): Quilt projects that you have started but haven't finished yet. It is quite usual for quilters have many of them. Walking foot: A kind of foot that you attach to a sewing machine so that it can help you feed the quilt through more evenly. Wonky: In this type of patchwork fabric pieces are cut at awkward angles and sewn together with no rhyme or reason. Y-Seams: A sewing technique where three different pieces of fabric are joined together to form a "Y". Yo-yo quilt: A kind of fabric embellisment made by using three dimensional circle.